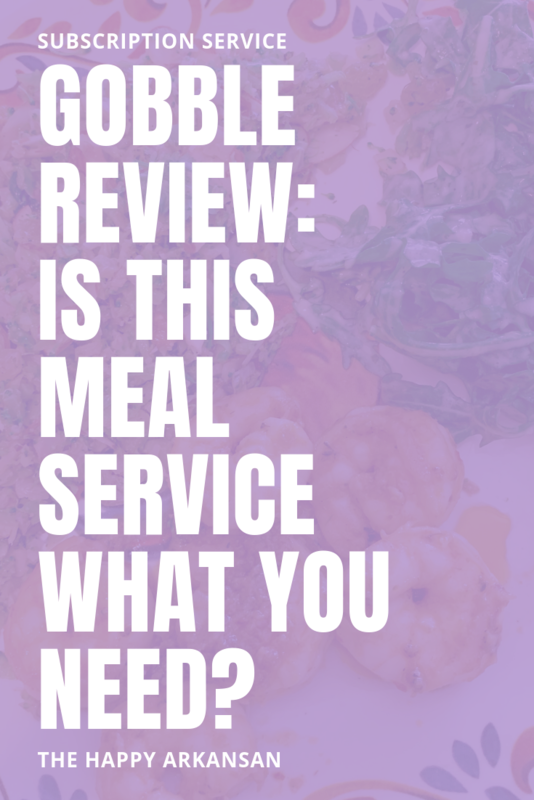 Gobble Review: Is This Meal Service What You Need?Gobble Review: Is This Meal Service What You Need? 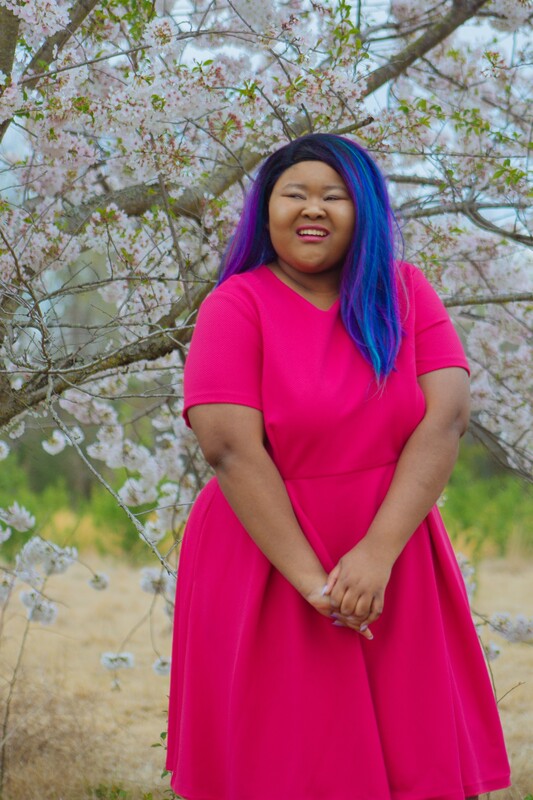 Before we get into the meals themselves, I wanted to spend a bit talking about some of the obvious things you want to know about like price, skipping meals, and changing up the meals you have access to. Gobble is a bit more confusing than other dinner kits I’ve seen, so I wanted to address a few things first. You can add as many meal kits as you want as there is no maximum order. There are also tons of sides, soups, desserts, and extras to add to your order if you want. 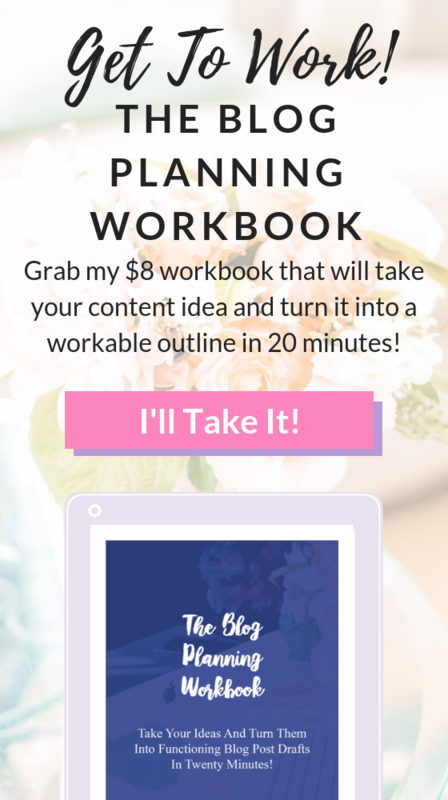 Do you want to save on your first week? Check out this excellent offer below that will get you six meals for $36 + free shipping! Skipping meals for the Gobble Box is a bit more complicated than other boxes I’ve tried in the past, but it’s still easy to do. Check out the Gobble home page. Scroll to a delivery you haven’t skipped yet. Press “edit delivery” at the very top. Once you want to skip, it’ll ask you why, and you choose one of the answers. You’ll get an email confirmation soon after you skip the week. If you decide at a later date that you do want the delivery, it’s even easier to get the order started again as long as the time hasn’t passed for you to get the delivery. You are automatically assigned three dishes each week, but there is so much to explore. You can switch dishes around, add more of Gobble’s delicious sides and breakfast items, and create a meal plan for the week that’s truly unique to you. Plus if you want to spend some extra money, you could even try their premium dinners for the week. 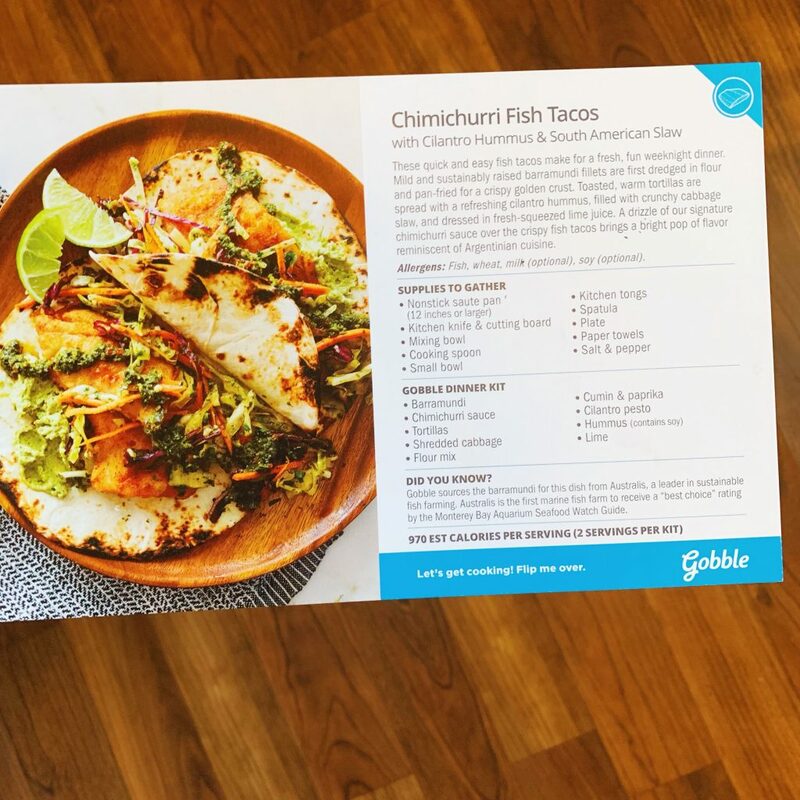 If you follow the instructions I just gave you for skipping Gobble meals up to the “see dinner menu” instructions, you will see the entire range of things you can add to your Gobble box if the meals they share don’t excite you. Gobble is a box that you prepare on the stove/in the oven. They take care of as much of the prep work as they can for you. You get preportioned ingredients that are ready to be put together out of the package. 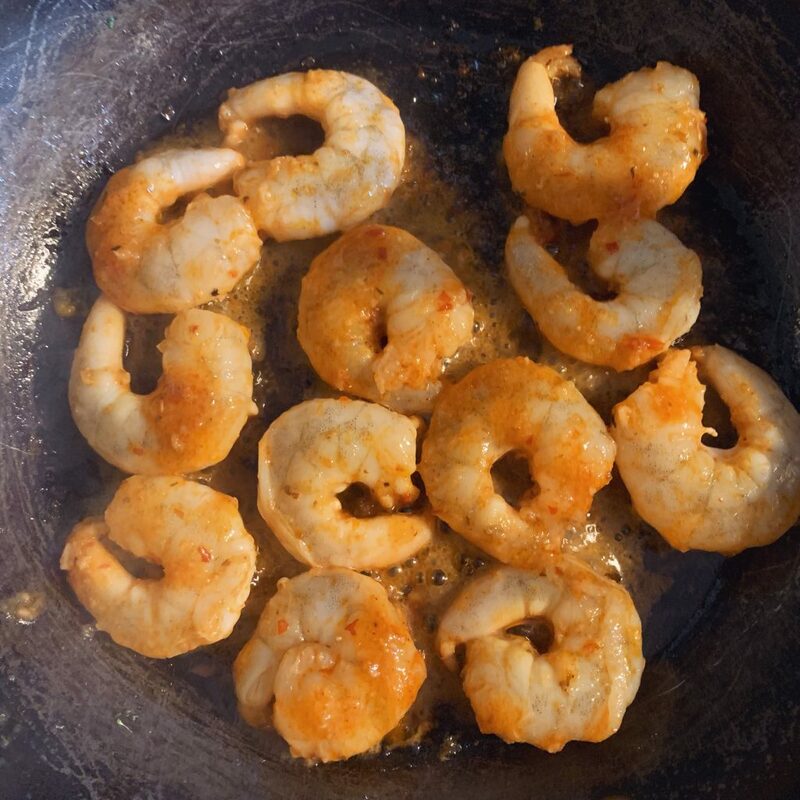 So, for example, when I created the rub for my Honey-Harissa Shrimp, I was given a pre-portioned amount of harissa sauce, honey, Sicilian garlic confit, and the mandarin orange I needed to make the marinade. This means that you spend more time just opening packages or containers instead of chopping or cutting. You may need to half an orange or quarter a lime, but you won’t need to do much more than that when it comes to Gobble meals. Each meal is sectioned into bags in the Gobble box which makes it extremely easy to find your ingredients. I’ve used boxes in the past like Dinnerly where the ingredients were just in the box, and you had to separate them in your own home. I liked the ease of Gobble sectioning your products, but I understood why Dinnerly didn’t do the same. Don’t worry, your meat or seafood is not in the same bag as your other ingredients. They are bagged separately, so you don’t have to worry about contaminating your vegetables with meat juice. Next, let’s talk about the meals. You guys, these meals didn’t come to play. Honestly, I’ve never had a meal kit that just knocked it out of the park. Every meal I had was amazing. One of the things I loved most is that these meals are simple, and they give you enough of the ingredients list to where I could replicate these dishes in my day-to-day life. It wasn’t just a bunch of dishes I didn’t feel I could reproduce, instead, Gobble was full of dishes I am excited to add to my recipe box. 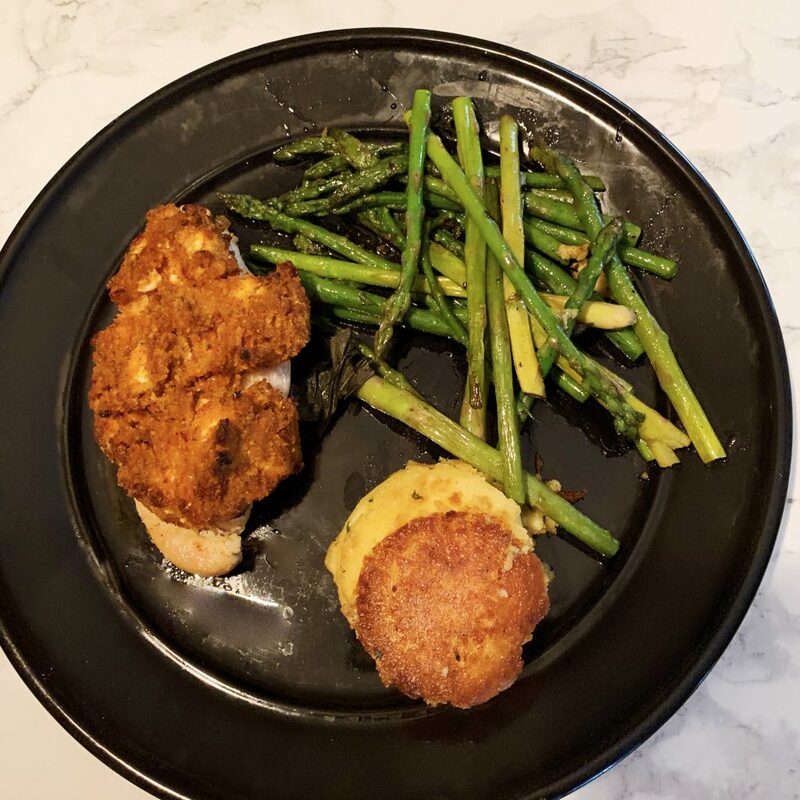 This was the first meal I made from my Gobble box, and I was honestly surprised. It came together in no time, and it was delicious. Not only that, but I felt genuinely inspired that I could easily add these recipes to my rotation. The shrimp was so easy to create, and so was the couscous. I got myself into trouble with the arugula salad because it was a tad too salty, but other than that I had a swell time creating this recipe. I loved that I honestly didn’t do a ton of chopping or need a ton of stuff. The only thing I cut was the mandarin orange. I was supposed to chop the cilantro, but I ended up just tearing it by hand. It was honestly a great experience not having to measure anything and just having so much freedom with the dish. One thing I loved about this dish was the quality of the ingredients. 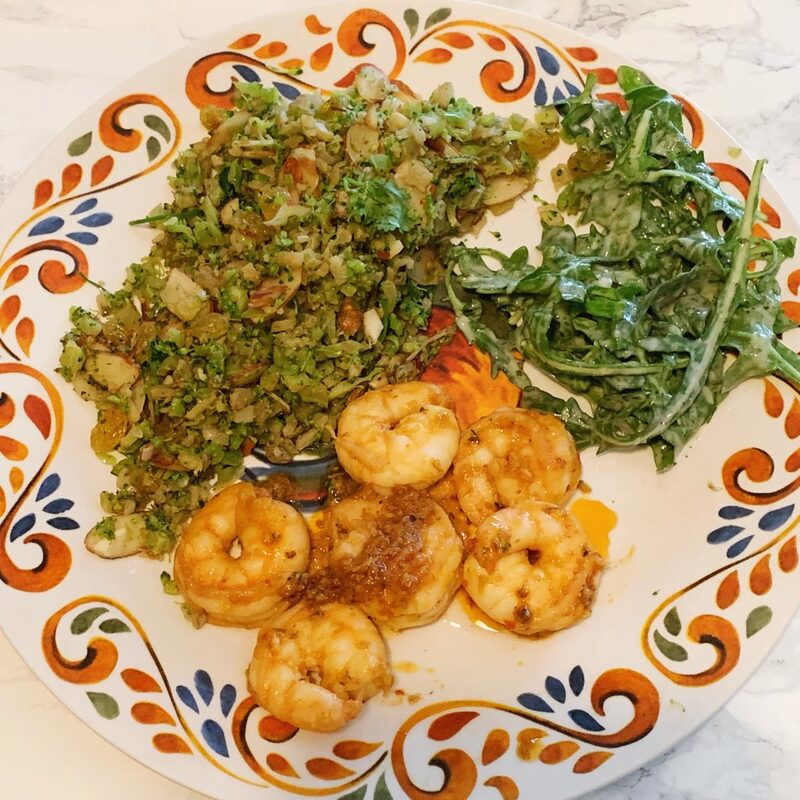 Everything was fresh, the shrimp were large, and I just had a great time with this dish in the kitchen. I never felt lost, and I always knew what to do next. The recipe instructions were so easy to follow. Not only that, but my mom loved the dish too. I ended up making this one when she was home with me, and she adored it. She is excited for me to find a way to include this dish in our routine. For a box that’s so simple to create I was surprised by how much I wanted to add these to my routine. Honestly, this dish was so yummy. I could have let my asparagus cook for a little while longer, but other than that one note, I adored this dish. This one was a bit more complicated because I had to start the chicken on the stove and transfer it to the oven, but overall, it wasn’t too bad. I was able to get every piece of this meal done to near perfection. I now want to experiment with more ways to add a crust like this to my chicken. Honestly, the amount of wonder and excitement I feel to experiment in new ways after eating dishes from Gobble is what makes me most happy. I also got to make these fantastic tacos for my mom and me one day. They were so easy to make, were so filling, and they were delicious. My mom loved them, and they opened her eyes to fish tacos and what they could be. 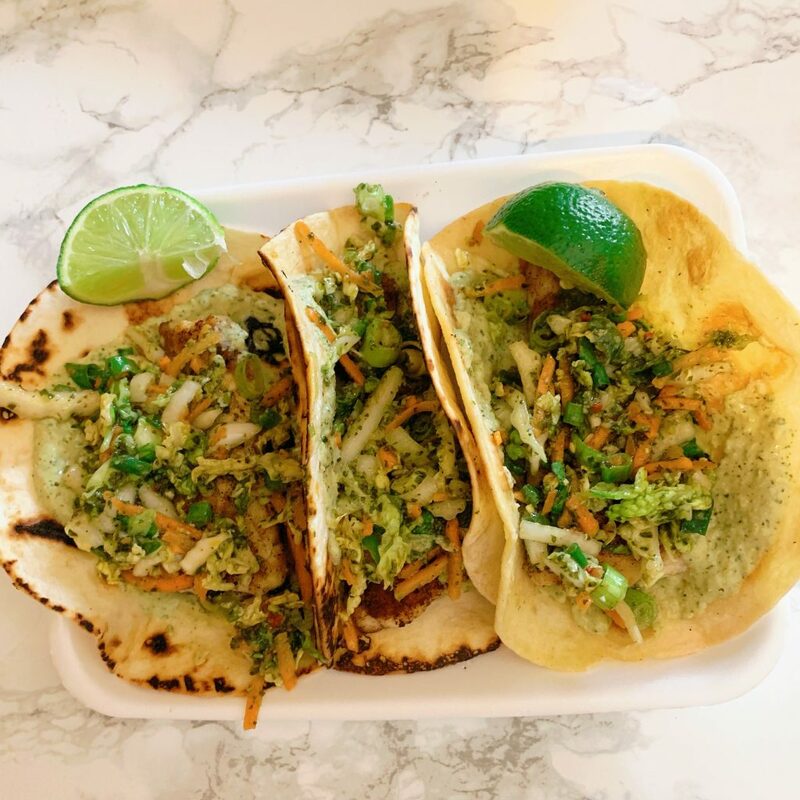 She always assumed fish tacos would be very fishy, but she liked that these had so much dimension and flavor. Also, the cilantro hummus I made for this dish was terrific and I happened to have some leftover that I put on a sandwich later that day, and it was still wonderful. Now, let’s chat about a few more things when it comes to my Gobble review. I honestly can’t get over how easy every dish was. Once I read over the recipe a few times, it was so easy to follow the instructions and get to cooking. Every meal turned out similar to the recipe card, and I was so impressed by that. Seriously, I’ve never seen a meal kit that I loved this much on the first try. My parents loved the meals too which made me happy because they don’t always like when I experiment on them with new meal kits in the house. As far as packaging is concerned, I feel like Gobble does a good job of keeping the excess packaging away as much as possible. Once you remove all the food from the box, the box is pretty light. There was only a couple of ice packs and a thin makeshift cooler in the box, so it’s super easy to get rid of once everything else in the fridge. I’ve tried a lot of boxes that make way more trash, so I was impressed by the lack of garbage produced by this box. Plus, one cool extra they added in my box was two of their amazing cookies. You guys, these things were huge and some of the yummiest cookies I’ve ever received. If you adore them, you can also add some cookies as extras in your Gobble box. They have a rotating cast of cookie characters like these chocolate chip cookies. 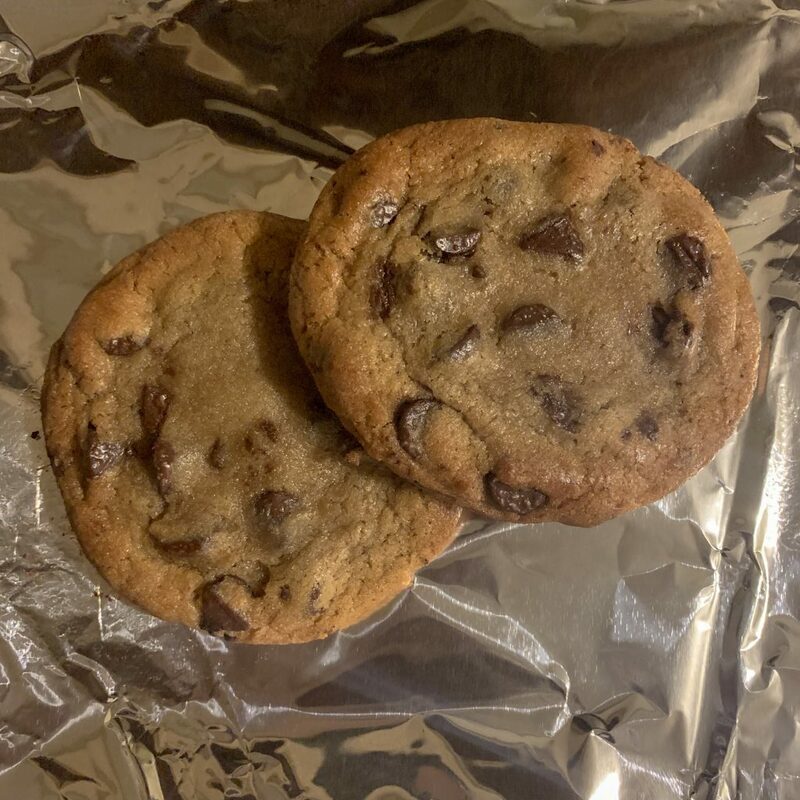 Plus, they also have white chip macadamia nut cookies and double chocolate chip cookies. The recipe cards were easy and quick to follow. One one side you have a bit about the recipe, supplies you need to gather, what’s in the dinner kit, and a fun fact. On the back, you have step-by-step instructions on how to complete the meal. Before you do anything, read the entire recipe card a few times, so you know where all your ingredients come into play. You may have a sauce or fruit you need to use in two places. You don’t want to use up all your ingredients prematurely! Did The Gobble Meals Take 15 Minutes? Okay, here’s something I do want to chat about, did the Gobble meals take 15 minutes? No. I won’t lie and say these meals were 15-minute meals. I think most of these took me closer to 30 minutes to cook. I’m not a speedy chef though, and I often don’t have all my stuff together before I start cooking a meal because I like to live on the edge. I will say that I never felt like the meals took an excruciatingly long time from start to finish. I never felt like I was cooking over a hot stove all day. Overall, the dishes were easy to create, even if they took longer than 15 minutes to produce. I don’t think this should stop you from trying out Gobble, personally. Would I Recommend This Box To Other Millennials? I would enthusiastically recommend this box to other millennials! I’m not a fancy cook by any stretch of the imagination. I can follow instructions, whip up a mean slow cooker meal, and make some basics like scrambled eggs. I’m not a five-star chef in the kitchen. I feel like these meals were easy for anyone to make with a little love and attention. If you want to create some fantastic dishes in the kitchen, but you aren’t quite adept at it yet, I encourage you to give it a try–at least for one week. Take advantage of the six meals for $36 deal they have going on right now. See if this is a meal service you’d like to add to your life regularly. There you have it! My full Gobble review. I hope that you all got something useful out of today’s discussion. I genuinely love this service, and I cannot wait to order another box soon. If you’ve been looking for a new meal kit to try I encourage you to give this box a shot while they are running the six meals for $36 deal. It’s a steal, and you can always skip future meals while you are giving the box a try at first. Do you use dinner/meal kits? Why do/don’t you?